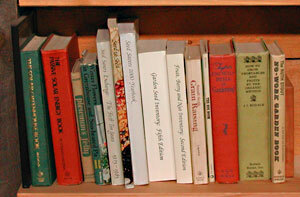 There are numerous books and publications and websites available to help in your seed saving and heirloom gardening. Here are a few of my favorites. Many are now out of print but they can be found in libraries and used book sources. Much of this information is timeless and as good now as then. Maybe even more welcome now! Seed to Seed, by Suzanne Ashworth. Seed Saver Publications, 1991. A comprehensive book on seed saving. I wish this one had been around when I started, I've used it often since. HIGHLY recommended, even if you don't want to save your own seed. Growing Garden Seeds; A Manual for Gardeners and Small Farmers, by Robert Johnson, Jr. Johnny's Selected Seeds, Albion Maine 04910, 1983. A good, inexpensive booklet to get you started. Garden Seed Inventory, by Kent Whealy. Seed Saver Publications, 1995. A comprehensive listing of mail order seed companies, the standard (open pollinated) varieties they offer, and the varieties which have been dropped. Fruit, Berry and Nut Inventory, by Kent Whealy and Steve Demuth. Seed Saver Publications, 1993. Comprehensive source book for mail-order nurseries in the U.S. with variety descriptions. Seed Savers Exchange: The First Ten Years, by Kent Whealy and Arllys Adelmann. Seed Saver Publications, 1986. Nice collection of articles from the first decade of the SSE. Seed Savers Yearbook, Seed Savers Summer Edition, and Seed Savers Harvest Edition are annual publications to members of the Seed Savers Exchange. How to Have a Green Thumb Without an Aching Back, by Ruth Stout, Exposition PR of Florida; and The No Work Garden Book by Ruth Stout, Rodale Press. If you find yourself fussing and worrying and getting too serious about your gardening, read Ruth Stout's books. They always bring me back to myself and the fun of growing things. Some of the best gardening advice I've ever read, too. Small Scale Grain Raising, by Gene Logsdon, Rodale Press (original version 1977). I read through this book so much it soon fell apart. I just saw that he's republished the book in a new edition. Hurray! Build it Better Yourself, by the editors of Organic Gardening and Farming, Rodale Press. Full of how-to and plans and projects. Enough to keep you busy for years. Farming for Self-Sufficiency: Independence on a 5-Acre Farm, by John Seymour, Schocken Books. One of those old (now!) standards that we read over and over with much enjoyment and inspiration. Mrs. Restino's Country Kitchen, First Edition, by Susan Restino, Quick-Fox Press. Now you've grown it, what do you do with it? This is the most down-to-earth, from the heart (and hearth!) book for garden-to-table gardeners and cooks. There's a newer addition but I like the first one best. Mine's yellowed and tattered but I still look things up now and then. Winter Flowers in Greenhouse and Sun-heated Pit, by Kathryn Taylor and Edith Gregg. Chls Scribner's Sons. Even if they don't talk much about vegetables, I gleaned more good how-to greenhouse garden from these ladies than I did from oodles of more academic tomes. Even if you don't have a greenhouse and never want to grow a flower, their style and attitude is worth it to read this one. Homesteading Adventures, a Guide for Doers and Dreamers, by Sue Robishaw. ManyTracks, 1997. Includes chapters on seed saving as well as gardening and growing food. 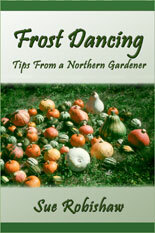 Frost Dancing - Tips from a Northern Gardener, by Sue Robishaw. ManyTracks, Third Edition, 2000. More than 240 tips, hints, and ideas for the short season gardener. "The Desert Smells Like Rain, a Naturalist in Papago Indian Country", by Gary Paul Nabhan. Nabhan is the founder of Native Seeds/SEARCH, a non-profit group dedicated to the preservation and distribution of native crops of the southwest. He is also author of many articles and the excellent book, "Enduring Seeds". "The Desert Smells Like Rain" is not a gardening book as such, and has little to do with our northern short season gardening challenges. It is about the Papago Indians, the Tohono O’odham or "Desert People" of Arizona/Mexico. It is about how they live, harvest and gather within that harsh desert country. It takes you to an area so vastly different from ours that it is hard to believe it is the same continent. Yet I found much to relate to, so much that is in many ways no different than the losses we see around us here. More poetry than how-to, but sometimes that is better. "The Gift of Good Land – Further Essays, Cultural and Agricultural" by Wendell Berry. Another non how-to book, but one full of experienced insights and observations. It is a book you will want to read when you have time to think about and roll around the ideas. "In the course of writing both books ["Unsettling of American" and "Gift of Good Land"] I have seen enough good farmers and good farms, and a sufficient variety of both, to convince me beyond doubt that an ecologically, and culturally responsible agriculture is possible. Such an agriculture is now being practiced, productively and profitably, by a scattering of farmers all over the country. The most necessary thing in agriculture, for instance, is not to invent new technologies or methods, not to achieve "break-throughs", but to determine what tools and methods are appropriate to specific peoples, places, and needs, and to apply them correctly. Application (which the heroic approach ignores) is the crux, because no two farms or farmers are alike; no two fields are alike."